*Photo courtesy of Make-Up Artist magazine. 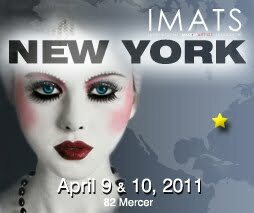 For the first time ever, IMATS is coming to New York City! IMATS, International Makeup Artist Trade Show, produced by Make-Up Artist magazine, features your favorite makeup brands who will be on site to demos their products and selling them at great insider prices! Don't forget there are educational classes on makeup trends (see schedule here) on both days of the show. I'm personally excited to learn about the Spring Cleaning Your Kit seminar.. which I need to do like, right now.. Taking place at 82 Mercer St. in Soho, New York, the IMATS New York in April will be an incredible show that you won't want to miss! This will be the second makeup trade show that I will be attending this season and I'm excited to go. Hoping for great weather and meeting up with my fave beauty bloggers again. I'm also excited to check out Jane Iredale Mineral Makeup, Jesse's Girl, Stila, Obsessive Compulsive Cosmetics, and more. :D Hope to see you there! Get your tickets to IMATS today! 2 day ticket- $65, 1 day ticket- $30. It sounds like a lot of fun as well as a great learning experience :D I hope you enjoy it!